College Lacrosse, which released last year on Xbox Live's Indie Games channel, returns this year with a new version and a slew of upgrades - including motion capture animations and an augmented control set. It will cost $5. Crosse Studios, which earlier this year developed what's thought to be the only fully licensed indie sports game in NLL Lacrosse 2010, will bring College Lacrosse 2011 to Xbox Live in December. In addition to motion capture animation and overhauled graphics, the game will feature improved shooting and a new dodging mechanic on the right analog stick, bullet and loft-style passing, dive shots, penalties and a stick-checking system. "As an indie team, I'm extremely proud to say we are the first company to develop a lacrosse video game that features motion capture animations," Carlo Sunseri, a former collegiate lacrosse player and the founder of Crosse Studio, said in a statement. "We went into the motion capture studio and recorded the most realistic lacrosse animations to date. You will not see any of the same animations from our original games. 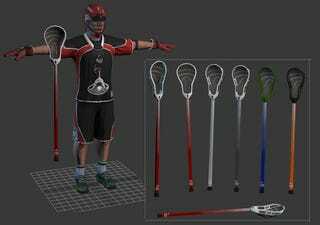 All of the animations in College Lacrosse 2011 have been redone and replaced with motion capture." For this, Crosse Studio hired two animators to support the work of U.K.-based Triple B Games, which also developed the two previous lacrosse titles. The artists' resumes include work for Ignition London, Headstrong Games, Electronic Arts and Digital Extremes. College Lacrosse 2011 will be available over the Xbox Live Indie Games Channel in North America and Europe in December.